I read several blogs and follow several regularly and follow ALOT of talented people on Flickr. I am very envious of their skills and talents. But that’s another story. I had the privilege of meeting Whiskey Monday once. It was not on the SL grid. I believe it was on Inworldz. We had a lovely chat about stuff and exchanged flickr urls. I delved into her flickr stream. Her work is captivating. It makes you stop and look and ponder. I began reading her blog to try to gain an understanding of what goes into the imagery she creates. Her imagery and words hit home for me. She took a break from blogging for personal reason earlier this year. I sort of lost track with the craziness that has been my life recently. I was rolling through my flickr friends and what did i find. Whiskey is back. I have gone back to catch up on her blog. She has been shooting pictures and blogging since the end of August. Welcome back. I missed your words and images. I don’t know where I have been but I almost missed one of my favorite shopping events of the year. 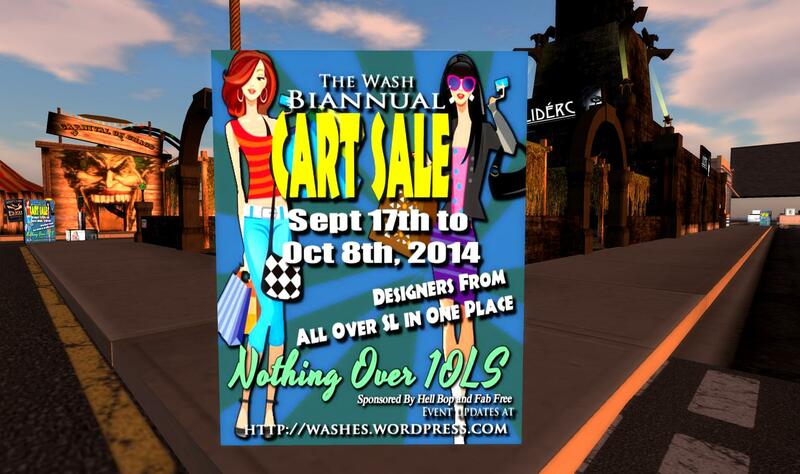 The Cart Sale at The Wash. Its only on untl Oct 8th. This version of the sale has alot to offer and more stuff for the men. Its still primarily a women’s shopping event. But there is also alot of accessory merchants there. The best thing is EVERYTHING and I mean everything is L$10. Here’s your ride – The Wash. When you are there check out my favorite retro store on the grid – Hell Bop. Breaking news; Facebook is changing its real name policy.